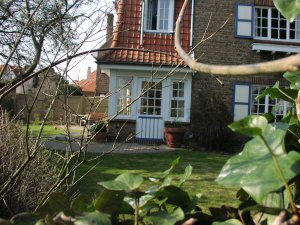 Carine and Christian will be pleased to welcome you in their cottage (dated 1930), in the hart of the Zoute ,at a short distance from the centre and the beach. The house is entirely available for our guests. There is a an attractive living room, a pleasant dining-room with view over the private garden, where you, on a beautiful day, can enjoy an extended breakfast with oven-fresh bread, fruit, cheese, homemade specialities, sereal or bacon with eggs. The familysuite for 4 people with a private bathroom with a bath, shower, double sink and a toilet. The sailorsroom for 2 people has a private bathroom with a bath, shower, sink and a toilet.